In general people just throw stuff away. 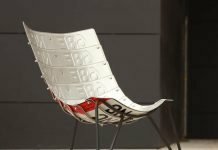 Looking closer at upcycle design you notice that it’s all about the way you look at trash, waste. Luckily there are more and more designers who take a look at waste in a different way. They create a second life and a new function and upcycle many unexpected materials and objects. 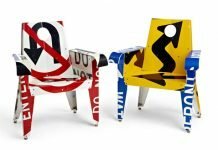 One of these upcycle designers is Dutch industrial designer Bastiaan Tolhuijs, founder of company TOLHUIJS, based in Amsterdam | The Netherlands. He creates designs by using materials and/or objects before they are being recycled. 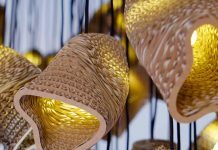 A great example of his way of looking at waste is his stunning and minimalistic lighting design called SPOOL. And now he has a new upcycle design product called FENCY. It’s a simple multi-functional storage system with great possibilities. The steel frames are waste products of a fence factory. Tolhuijs took these frames and gave them a fresh powder coat and added several wooden shelves. 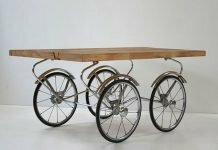 This attractive and creative upcycle solution is a fantastic example of added value, a second life and a receiving new function. “A lot of energy is wasted on material from which we can still derive value! For many big factories the story ends with waste materials. The FENCY shelves come in different sizes and colours and are available in pressed pallet wood, normal pallet, laser and Perspex. To keep it 100% upcycled I would choose one of the the pallet versions. FENCY is a great storage and/or display system that allows you to create your own personal fit. And after some time it’s easy to rearrange the shelves into a fresh new custom look and layout.